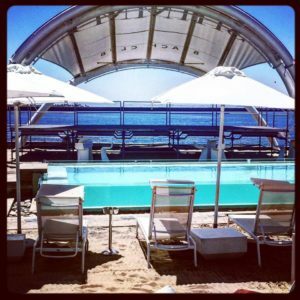 Hot summer ahead at Shimmy Beach Club, new summer menu launched, with hot music! 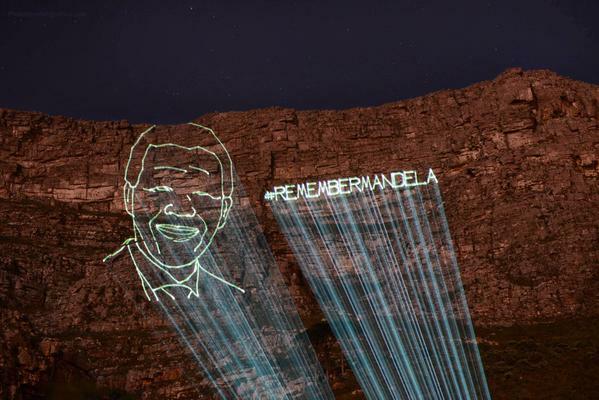 * The image of the late Nelson Mandela was projected onto Table Mountain on Friday and Saturday evening, to commemorate the passing of our country’s former leader on 5 December 2013. * Despite its promise of no more loadshedding in December, Eskom’s severe Stage 3 loadshedding kicked in on Friday, and continue this weekend, meaning twice-daily outages or more per day in most areas. Eskom says it is building up power reserves for the week ahead! J&B Met 2014: Cape Town ‘Made to Conquer’, ‘victorious dress’! The 37th J&B Met will be held at the Kenilworth Racecourse today, the longest standing sport event in the country. More than 50000 fashionistas, socialites, and horse racing fans are expected to attend the event which has a jackpot of R2,5 million generates about R68 million for Cape Town and the Western Cape, and creates an income of R14 million for fashion design alone. The theme this year is ‘Made to Conquer – Dress Victoriously’, and will inspire the J&B Met attendees in buying their outfits for the most prestigious society event. The J&B Most Elegant Couple Competition will acknowledge the most creative interpretation of the theme. Shop windows of fashion outlets in top Cape Town shopping malls will be dressed to match the theme. Western Cape Tourism Minister Alan Winde lauded the economic impact of the event: ‘The J&B Met illustrates the importance to our economy of events tourism. It’s one of 19 events which contribute more than R1.3 billion to our regional GDP. 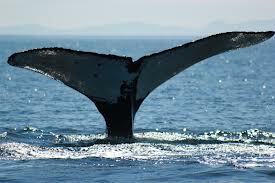 In the previous financial year, these major events attracted close to 200 000 tourists to the Western Cape. Over the next few weeks several signature events will be taking place including the Mining Indaba, the Design Indaba and the Old Mutual Two Oceans Marathon. With its R2.5 million main prize, the J & B Met is a premier fixture on the Western Cape’s events calendar. I believe the Western Cape economy is the real winner of the Met, as the event attracts over 50 000 visitors and generates an estimated R68 million for the province. It’s a key economic driver and plays an important role in job creation, most notably in the events tourism space‘. 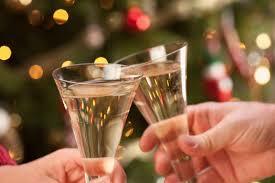 Festive Season 2013/14 celebrations in Cape Town and Winelands restaurants! We will update our list of Christmas Eve dinners, Christmas Day lunches, and New Year’s Eve dinners and parties as we receive more details. Cape Town: City of Inspiration to work at addressing challenges in attracting business! Cape Town Tourism has been conducting a series of ‘Brand Cape Town’ workshops since late last year, to share with its members as well as bloggers and other stakeholders what the outcome has been of a brainstorming session to find a positioning for Cape Town and what it can/should be, and to focus its marketing activities, not only from a Tourism perspective, but also from a general Business approach. Scanning the external environment, it identified threats such as the economic crisis, global urbanisation, and a greater consciousness about the impact of flying on the environment and climate change. It also faced the reality that the seasonality in Cape Town’s tourism industry, unique to our city compared to others in the country, reflects that Cape Town does not have enough business tourism, being the result perhaps of too large a focus on Leisure Tourism in the past, and too little on attracting businesspersons to have their meetings, events and conferences in Cape Town. Comparing the positioning of major world cities, e.g. Paris is Romance, New York is Energy, London is Tradition, it has historically been Beauty for Cape Town. Through its analysis, it was identified that the positioning of Inspiration is an overarching one that can position Cape Town beyond its more narrow tourism focus, to a broader one, reflecting the strengths of the City in respect of beauty, freedom, innovation, hope, creativity, diversity, dreams, ideas, and solutions to problems. * Living contemporary culture with African and European roots, which is not gumboot dancing! * Rich music tradition, in goema and Cape Minstrel music, but also current, with Goldfish, Jack Parow, Freshly Ground, Kyle Shepherd, Locnville, Die Antwoord, and Abdullah Ibrahim. 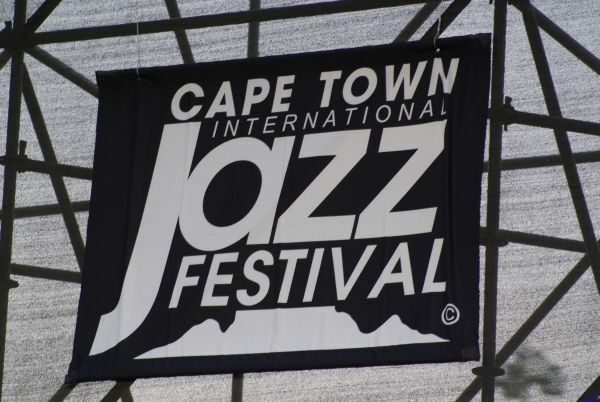 The Cape Town International Jazz Festival has become a world event. * Africa’s first billionaire and space traveller Mark Shuttleworth, and his Shuttleworth Foundation, supporting IT development. Development of Silicon Cape. * Fresh produce markets, with organic foods, outstanding restaurants such as The Test Kitchen and Mzoli’s Meat define Cape Town, and the plan is to develop a Master Chefs Cape Town series. Having Justin Bonello showcase South African food is a boost for the city. Charly’s Bakery is a passionate, all-women team, who baked a cake representing Cape Town for the Design Indaba. * Cape Town is one of three finalists for World Design Capital 2014, with Bilbao and Dublin, spearheaded by the Cape Town Partnership. The judges will be in Cape Town from 24 – 27 July, and the winning city will be announced on 26 October. The Design Indaba is a design highlight for the country, with its annual conference and exhibition. At the last exhibition, attendees were asked to write in support of the city’s bid – this comment summarised what Cape Town stands for: “Cape Town’s people are her most beautiful landscape”. * Cape Town has a vibrant fashion scene, designer Dion Chang saying that “The tip of Africa is the tipping point”. * Cape Town is at the center of the magazine publishing industry. * The Joule electric car is being built in Cape Town, the first in Africa. * Economy based on tourism, finance, infrastructure, food and wine, logistics, and creative industries. * Brand Cape Town’s strength is Tourism (Visit), it is neutral on its education and residential facilities (Live and Learn), and weak on its potential as a centre of employment and investment (Work and Invest). * Cape Town is a ‘challenger brand’ which does not have a long-established history, and stands for freedom, freshness and transformation, attractive to a world that has got tired of visiting boring places. “Challenger brands harness the power of authenticity, locals first, emotional pull, storytelling (Word of Mouse)”. * The pillars of Cape Town are Robben Island; its cultural diversity; the food and wine industry; Biodiversity; Table Mountain; Cape of Good Hope; hubs of innovation, creativity, enterprise and government; higher education and skills training; Sports and MICE; and Colour and Light. Cape Town Tourism is to assist business-related bodies in the city to market the city with a ‘brand box’. It has worked with Accelerate, Cape Town Routes Unlimited, Wesgro, Cape Town Partnership, and the City of Cape Town in developing the new positioning for Cape Town, to establish it as ‘one of the top world cities to live, work, invest, learn and visit, in order to drive inclusive economic growth and social transformation in Cape Town’. The presentation we attended was the last, and the implementation phase will now commence, Mrs Helmbold said. In question time, FEDHASA Cape chairman Dirk Elzinga stated that great things are happening in Cape Town, but ‘we are not telling the world’, he said. Mel Miller, former ad agency owner and creative director, and ex Cape Town Tourism Board member, is very critical of Cape Town’s new ‘Inspirational’ positioning, saying that it has been used by Edinburgh (‘Inspiring Capital’) already. Miller points out that a previous tourism strategy consultant to Cape Town Tourism comes from Edinburgh! Mrs Helmbold showed a video presentation by Silver Bullet meant to represent Cape Town. It was certainly not one of a beautiful Cape Town, but one of a very cloudy looking Cape Town, with a lot of focus on clouds billowing over Table Mountain and the Twelve Apostles, and what appeared as a fast-speed race through Cape Town. I was NOT inspired by it, and it did not represent any of the Inspiration that Mrs Helmbold had presented to the audience. The World Cup has put Cape Town into a party spirit, especially on Thursday, when the Cape Town Fan Park outside the City Hall opened with R. Kelly, and on Friday evening, after Bafana Bafana and Mexico drew their match. 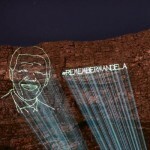 One could have sworn that Mandela had just been released from Victor Verster all over again! 1. The Cape Town FIFA Fan Fest at the Grand Parade Fan Park can hold 25 000 “jollers” (Afrikaans word for â€˜partygoers’), but it is estimated that 42 000 partied there on Friday. Local bands will perform at the Fan Fest every day, from 11h00 – 23h00. More than 100 artists will perform at the Cape Town Fan Fest on the Grand Parade, reports the Cape Argus. According to the People’s Post, Goldfish performs today at 18h00; tomorrow BLK Sonshine and CODA perform from 18h00; Loyiso is on stage on 16 June, Liquideep on 17 June, and The Rudimentals on 18 June. Other performers include Robbie Jansen and Friends, Project, Kalahari Surfers, Brasse Vannie Kaap, Iqulah, Fezeka High School, Soul Makossa!, Ghorwane, Phuzekemisi, K’Naan (29 June), Karambola, FreshlyGround, Capsolys, Abekaya, Gang of Instrumentals, Danny K, The Rockets, Prime Circle, Flat Stanley, and Flash Republic. Local South African foods such as Cape Malay chicken curry, lamb neck potjiekos, boerewors rolls and biltong are for sale, as are burgers, hot dogs, prego rolls, calamari, lasagne, soup, pizzas, and French fries. One may not bring one’s own food into the Fan Park. 2. Other Fan Fests are at the Bellville Velodrome, Vygieskraal Stadium in Athlone, the Swartklip Sports Complex in Mitchell’s Plain, and the Oliver Thambo Community Hall in Khayelitsha. 3. The Brazilian community has turned the Civic Centre on Main Road in Sea Point into a home for Brazilian soccer fans. By day Casa Brazil will be an exhibition area for the country, and at night it will have a Rio carnival atmosphere. 4. Cool Britannia, the United Kingdom’s largest events company, is hosting an on-going soccer celebration at the Cape Town International Convention Centre for the duration of the World Cup. Every day a different qualifying country will be showcased, from midday â€“ 3h00. The opening act was Estelle (â€˜American Boy’), performing in South Africa for the first time. Other performers that are expected are Fatboy Slim, 340ml, Tucan Tucan, Euphonik, HHP, Black Coffee, Milkshake, Ricardo da Costa, La Vuvuzela, Liquideep, Flash Republic, Dean Fuel, and Roger Goode. DJ Fresh and DJ Dino Moran will also be on show. The Parlotones will end off the month-long party. South African fashion design by Gavin Rajah will be featured at a fashion show on 15 June. Ticket prices range from R 150 â€“ R 400 per person, and can be bought at Computicket. 5. As a non-official “fan mile”, Long Street has plenty of vibe (and beer), and the most popular watering holes are The Dubliner, Joburg, Lola’s and Long Street Cafe, the World Cup volunteers tell me. 6. The V&A Waterfront is also attracting soccer fans (100 000 visitors on Friday), due to its proximity to the Cape Town Stadium. Ferrymans is popular, the Paulaner Brauhaus is entertaining the German fans to Cape Town, the Lookout Village marquee on top of the parking garage on the Granger Bay side, and the MTN Fan Zone near the Clock Tower is also attracting soccer fans. 7. Other popular pubs are the Fireman’s Arms off Buitengracht Street (supported by England fans), Tommy’s Sports Bar in Loop Street (supported by Dutch fans), Pata Pata in Bree Street (supported by Cameroonian fans), 4 Ways in Darling Street (supported by Nigerian fans), and the Mexican Kitchen in Long Street (supported by Mexican fans). POSTSCRIPT 21 June: Cool Britannia was reported on Kfm yesterday to have closed down at the Cape Town International Convention Centre, due to unsatisfactory support. The World Cup 2010 Kickoff Concert taking place at Orlando Stadium in Soweto in Johannesburg this afternoon has been strangely shrouded in secrecy as far as the music stars performing is concerned. It is the first step in the final countdown to the start of the World Cup tomorrow. What is known for sure is that Shakira has arrived, and that she will be singing the official World Cup song ‘Waka Waka’ with Freshlyground. Other performers known to attend are the Black Eyed Peas, Goldfish, John Legend, Alicia Keys, Kwani Experience, Tumi Molekane, Loyiso Bala, Lira, Angelique Kidjo, Blk Jks, Hugh Masakela, K’Naan, Juanes, Soweto Gospel Choir, The Parletones, and Vieux Farka Toure, according to the 2010 World Cup website. The Concert has been criticised by local performers, for not including enough local musicians. The World up Kickoff Concert will be broadcast on SABC at 20h00. The German TV station ZDF will be broadcasting the show from 20h15, and the presenters will be talkshow host Thomas Gottschalk and ex-Miss South Africa Jo-Ann Strauss, presenting in German. On the Grand Parade Cape Town kicks off its own “Cape Town Welcomes the World” concert from 14h00 today. Local bands will perform, and R Kelly is the star musician who will also perform at the Kickoff Concert in Johannesburg. More than 100 artists will perform at the Cape Town Fan Fest on the Grand Parade, reports the Cape Argus. According to the People’s Post, Jimmy Dludlu performs at 18h00 tomorrow; Oliver “Tuku” Mtukudzi is on stage on Saturday; Goldfish perform on Sunday at 18h00; on Monday BLK Sonshine and CODA perform from 18h00; Loyiso is on stage on 16 June, Liquideep on 17 June, and The Rudimentals on 18 June. The tenth Cape Town International Jazz festival takes place at a variety of venues this weekend, with a line-up of top jazz artists set to entertain the 32 000 jazz fans. Top jazz artists such as Freshlyground, Kyle Eastwood (son of Clint Eastwood, who is in Cape Town shooting a movie about the Rugby World Cup 1995), Shakatak, Abigail Khubeka, Goldfish, Hugh Masekela, Jonathan Butler, and the Stylistics will be performing at Rosies, Kippies, Basil ‘Manenberg’ Coetzee, Bassline and Moses Molekwa. 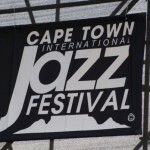 “The International Jazz Festival is an important event for Cape Town’s tourism sector too. Visitors to the festival fill the city’s hotels and restaurants and create a spotlight on Cape Town. The Cape Town Jazz Festival is an important international event that has a long history within our democracy. In fact, it is an event that really celebrates the triumph of our country through its multi-cultural, multi-national line-up. People from far and wide come to our city to listen to the legends of jazz and Cape Town itself is so much richer for the presence of these talented people. The tourism sector benefits hugely through increased occupancies and other activities”, says Mariette du Toit-Helmbold, CEO of Cape Town Tourism. Cape Town Routes Unlimited estimates that the Jazz Festival generates R 430 million for the economy of the Western Cape. More details are available at www.capetownjazzfest.com.